Think you know everything there is to know about light-curable adhesives? Think again. Dymax offers a fast-bonding solution for plastic-to-plastic and plastic-to-metal substrates. Many companies are moving away from solvent-based technologies as part of eco-initiatives, Michelle Gumbert, marketing manager of Dymax Corp., tells Qmed. "With various environmental laws and acts such as Registration, Evaluation, and Authorization of Chemicals (REACH) and the Clean Air Act making it increasingly important for manufacturers to adopt organic processes in manufacturing, toxicity and high volatile organic compounds (VOC) emissions from conventional solvents are becoming a major concern," she said. Solvents also "do not typically work well with thermoplastic elastomers (substrates), which are a common choice for medical devices," she added. 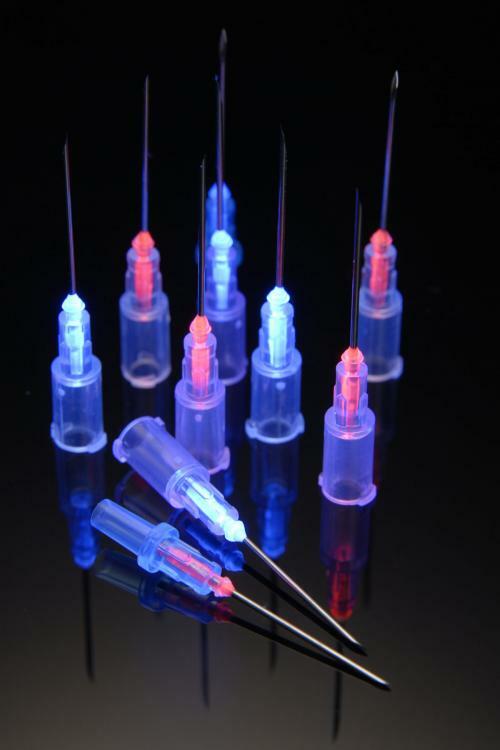 Offering light-curable adhesives as alternatives, Dymax is highlighting a fast-bonding solution for needle bonding, blood transfer devices, and more at MD&M West in Anaheim, CA, February 7-9. Suitable for plastic-to-plastic and plastic-to-metal substrates used in medical device assemblies, the LED-curable 1405M-T-UR-SC is formulated with Dymax's Encompass technology. Full cure can literally be 1-2 seconds, depending on the equipment and application. There's no need for ovens, racks, fixtures, or a delay in processing as parts are ready to be handled immediately. Advancing adhesive technology means more and more products are LED optimized to work with 385-nm or 405-nm LED, allowing companies to switch away from broad-spectrum bulb-based systems and enjoy all the benefits of LED technology. Most light curable adhesives are fully compatible with standard sterilization techniques (EtO, Gamma). Light-curable adhesives are compatible with a wide range of dispensing equipment as they come in a large range of viscosities. Most light-curable medical-grade adhesives can be stored at room temperature and are ready to use when the customer is ready--no need to mix, worry about pot life, etc. Two popular questions engineers ask include whether the adhesive is fully cured and whether it was placed where it was supposed to be, says Gumbert. "Dymax materials have been designed to help answer these questions," she explained. "Dymax's adhesives formulated with Encompass technology employ the company's See-Cure color change and Ultra-Red fluorescing technologies into one light-curable product. SeeCure materials transition from blue to colorless when fully cured, helping manufacturers verify their cure process and visually see if there are any shadowed areas (areas where the adhesive is not exposed to the light needed to cure) or if the cure time and intensity are adequate. This is helpful during validation and during production. Dymax adhesives can also fluoresce either red or blue under low intensity 365-nm black light, allowing for inspection for placement within a bond joint. This is useful on manual lines up to high-speed automated lines. The red fluorescing is especially useful when blue fluorescing substrates (like PVC) are used." Encompass was launched in 2014. Dymax works with medical device manufacturers on all types of applications, but its primary focus is on single-use, disposable, or short-term (<29 day) implantable devices, says Gumbert. "Our Application Engineering group is always available to determine if our materials will be a good fit for any application," she said. Dymax medical adhesives are tested to ISO 10993 for compatibility in medical devices, she added. "ISO 10993 is the international standard where USP Class VI is for the United States only, and we test to the global standard to support our global customer base. Having the adhesive be tested gives some level of assurance to the device manufacturer that when they test their overall device, the adhesive will likely not cause a failure (as long as it was processed properly)," she said. "FDA requirements are very strict with their standards, and Dymax works with customers through their approval process to support with answers to questions on biocompatibility, aging, substrate selection, process validation, etc. Of course, it will always be up to the manufacturer to build and validate their product and process; Dymax is willing to work with them along the way." Visitors to Dymax's booth (#2139) will see demonstrations of a variety of adhesives for needle bonding as well as curing demonstrations featuring the MX-150, the BlueWave LED flood system, and the BlueWave 200 UV Curing Spot Lamp. Demonstration videos can also be viewed at http://dymax.com/resources/videos. Daphne Allen is executive editor of Pharmaceutical and Medical Packaging News and a contributor to Qmed. Reach her at [email protected].